Follow these 6 Steps on how to gain muscle fast. If you want to know how to gain muscle fast you need to find the ideal balance between eating the right muscle mass foods, training effectively, taking the right muscle building supplements and recovering between each heavy training session. Follow these six steps on how to build muscle fast to keep you on track and help you build bigger, stronger muscles. How to Gain Muscle Fast – Step 1. To build muscle mass fast you need to eat big, eat often and eat quality foods for building muscle mass. To build bigger muscle your calorie intake must be greater than the energy you use and should be provided by a combination of protein, complex carbohydrates and good fats in order to supply glycogen to muscles for fuel and to help repair, grow and build muscle fast. Each muscle meal you eat should be rich in protein from eggs, beef, chicken, turkey, fish and quality building muscle protein powders such as Vitalstrength Pro-Muscle. Good sources of muscle building fats include flaxseed oil, nuts and peanut butter. Choose muscle building carbs such as brown rice and sweet potato that provide a sustained release of energy to your growing muscles and help you to get muscle building mass results. To gain muscle mass fast try to eat at least 8 times per day. How to Gain Muscle Fast – Step 2. Progressively overloading your muscles is the key to gain muscle fast and training using a variety of different techniques and percentage of rep-maximums will help you build muscle mass. As a rule, to grow muscle mass, you need to firstly build muscle strength. This is why many bodybuilders take a power lifter’s approach of lifting very heavy weights with low reps to gain muscle mass fast. This lifting method combined with compound movements will support the most increases in building muscle mass because of muscle fibre stimulation and strength gains. Compound movements are those that involve several muscle groups and more than one joint, and are the biggest muscle builders. Examples are squats, leg press, lat pull downs and bench press. Heavy weights and compound movements should be incorporated into your building muscle mass program at least 3 times per week. Choose a muscle group and a compound movement to train heavy (4-6 sets of 1-5 reps) for one muscle building workout. Perform around 4 exercises for that muscle group to overload the growing muscles, around 3-4 sets, not necessarily as heavy as the first. Ensure the muscle group has time to recover and grow before training it again. How to Gain Muscle Fast – Step 3. When your goal is to build muscle fast it is often counterproductive to do too much cardio. This is because to build bigger muscle your calorie intake must be greater than the energy you use, and often regular cardio sessions will burn through your calories too quickly and limit your muscle gains. Particularly if you are hardgainer and have trouble building muscle size, it is best to focus on heavy resistance and eating big when you want to gain muscle fast. Spend your time in the gym lifting heavy rather than running on the treadmill. If you are looking for the fat loss benefits associated with cardio we recommend high-intensity sprinting, which leads to greater fat loss than low-intensity cardio and in some studies has been shown to maintain and possibly increase building muscle mass. How to Gain Muscle Fast – Step 4. To gain muscle mass, you need an ideal balance of macronutrients at every meal. Finding supplements that help you to hit your macros and accelerate your muscle mass gains is a key step to getting bigger muscle results. First you need to choose the right protein powder. Vitalstrength Pro-Muscle Protein is high in protein and packed with muscle building amino acids, contains complex carbohydrate energy to fuel your growing muscles plus it has added fat burners for optimum muscle building results. 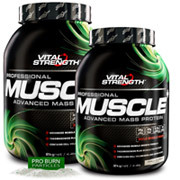 Vitalstrength Pro-Muscle Protein is a convenient muscle building food to have post workout and in between meals. Mix with 300ml of milk, stir into your oats in the morning or add to your muscle gain smoothie. Adding supplements like BCAAs and L-Glutamine to your post-workout shake or consuming these before you go to bed will further enhance your muscle mass results. Click here for more supplements designed to help you gain muscle mass and size. How to Gain Muscle Fast – Step 5. There are lots of reasons why you might like to train alone, but the problem is you may be limiting your muscle gains because of it. Having a training buddy can be great motivation, and having made a commitment to someone else to train together may ensure you don’t skip a muscle building workout. Whilst these reasons will help gain muscle mass, it is physical reasons why we suggest you sort out a training buddy to get gain muscle fast. Reason you need a training buddy to gain muscle mass fast: a training buddy can provide support so you can lift more, particularly with a low rep, heavy weight workout, whilst ensuring you keep form. Because gaining muscle mass and building muscle requires your muscles to reach complete fatigue, a training buddy can help you push out those last few reps, and ensure total muscle exhaustion. If you are training by yourself, you may not be able to push out those extra reps due to incorrect form, possibly causing serious injury. How to Gain Muscle Fast- Step 6. Muscle mass isn’t just built in the gym, it is what you do after that will get you serious muscle building size results. If you want to gain muscle fast you need to give your muscles time to rest and recover between heavy training sessions. When you lift, your muscle tissue and energy stores are broken down and depleted so it is vital that you plan recovery time between muscle building workouts, get plenty of sleep (7-8 hrs per night) and fuel your body with muscle recovery nutrients. Try to avoid training the same muscle group on consecutive days, drink plenty of water and maybe even get a massage from time to time. If you are serious about building muscle fast, special attention should be paid to your post-workout meal or shake. 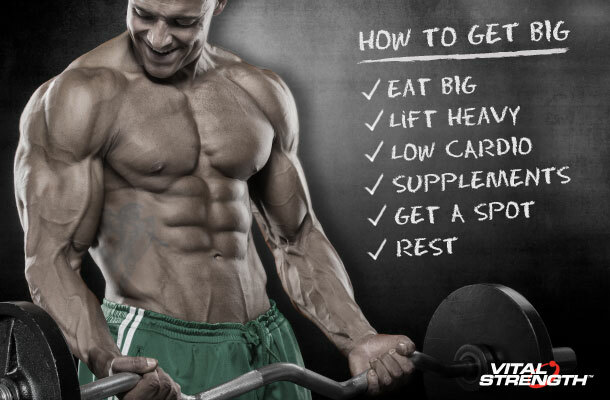 Vitalstrength Pro-Muscle is the perfect post workout protein supplement to gain muscle size. Plus L-Glutamine and BCAA’s can help to repair and grow muscle. Another key to building muscle mass fast is resting between sets so that you preserve your strength for heavier lifts. To maximise results from each set (at low reps) aim to rest for around 3mins so your muscles are ready to fire for each muscle building rep.
How to Build Muscle Fast Tip: Use these 6 steps on how to gain and build muscle fast as a foundation for your muscle growth program. If you want to build bigger muscle fast it comes down to determination, consistency and dedication to your training and nutrition goals.